South Korea's Kim Eunjung shouts for instructions during the curling women's round robin session between Canada and South Korea during the Pyeongchang 2018 Winter Olympic Games at the Gangneung Curling Centre in Gangneung on February 15, 2018. Every Olympic Games need a meme hero. For the 2018 Winter Olympic Games in Pyeongchang we give you the steely-eyed glare of Kim Eun-jung, team captain of the South Korean women's curling team. Eun-jung and three of her curling teammates are graduates of Uiseong Girls High School, located about 80 miles south of Pyeongchang. Their local farming town, Uiseong, is known for producing garlic and inspired the Korea curling team’s new nickname, the Garlic Girls, according to The New York Times. 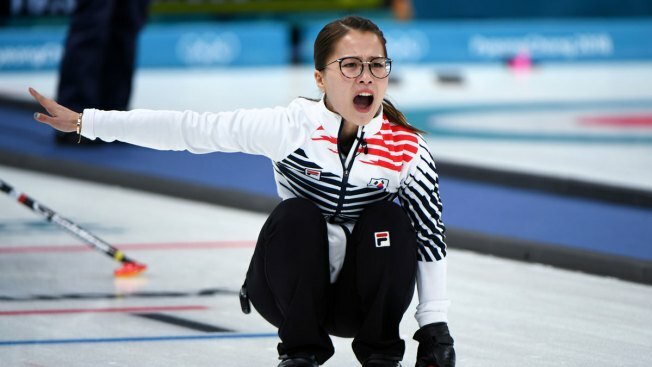 No one is quite sure when or how it happened, but Eun-Jung's bespectacled visage has become Internet gold over the past few days of competition. Is it a mere coincidence South Korea currently stands in first place of round robin play at 8-1 and has clinched a playoff berth? We think not.